Home > News Articles > It’s round 2 for the CLIA Cycle to the Ball! This December, Giles Hawke will be heading up a team of intrepid cyclists from the cruise industry to take on an 80-mile cycle challenge to the CLIA Winter Forum. Making up the team will be Tony Roberts and Robbie White – who are back for a second year – and Bernie Carter, Stuart Leven, Dave Mills and Richard Singer. The team will start at Bishop’s Waltham, Hampshire, on December 18 and ride towards De Vere Cotswold Water Park Hotel in Gloucestershire where the CLIA event will take place the following day. 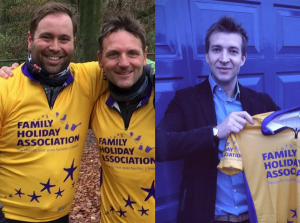 In December 2017 Tony Roberts, Robbie White and Giles Hawke cycled 80 miles over two days, during which they battled four seasons in one day, and raised an incredible £3,142 for the Family Holiday Association. All money raised will go towards the joint CLIA and Family Holiday Association campaign ‘What a Difference a Day Makes’ aiming to send 250 struggling families on a precious day out to the British seaside or local tourist attraction. Just one day away from these terrible circumstances can make a world of difference for families struggling with some of the toughest challenges life can bring. Thanks team, we wheelie appreciate your support!